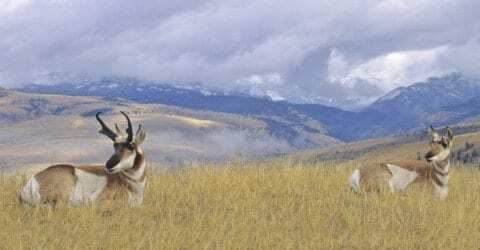 Pronghorn populations are dropping in the greater Yellowstone area because of poor habitat conditions due to the development of oil fields in Wyoming. This development limits the pronghorns migration and does not allow the pronghorn to sustain numbers or rebound from decreases in their numbers. Wyoming has gone through a drought the past few years, which has also pose an additional challenge. Pronghorn need some time for their population to grow. One possible option would be to catch pronghorn in other locations where their population is more plentiful and relocate them into the park. This is similar to what they did for the wolves. This project could have a huge impact on the herd. The problem with the pronghorn population in Yellowstone is that their numbers aren’t where they used to be. Hunting inside of the park until 1883 had a slight affect on their population too. Due to overgrazing in the park, management removed roughly around 1,500 Pronghorn from 1918-2002. A majority of the removals was from 1945-1966. The removals from 1985-2002 were on private land because the farmers and ranchers were complaining about crop depredation. There was a sudden decrease of the pronghorn during the 1990s that still remains unclear. Another problem with their population is that coyotes and other predators are catching and killing the fawns. The most effective way to increase the pronghorn population in a specific area would be to relocate them from an area where there is a great abundance of pronghorn, capture them, and then transport them to Yellowstone. This would be one big project though and would take tons of people. First of all, we would have to figure out a specific way to capture them, which could be very difficult. Next we would have to sedate the animals so they don’t panic and kill themselves. Then, we would have to transport the group of pronghorn safely to the other location. Once that’s all done, we would just have to give them some time. Eventually they’ll start to breed, and we will begin to see an increase in size. Relocating the pronghorn and trying to figure out a way to limit oil production are probably going to be our most effective options to try and bring their numbers back up. I hope to hear in the near future there’ll be a group of people who are willing capture and relocate them. If I could, I wouldn’t hesitate to help them relocate the pronghorn. I believe that there would be a big increase in their population within a few years. Yellowstone National Park: Op-Ed Letter by Colton is licensed under a Creative Commons Attribution-ShareAlike 4.0 International License.